Received traditional Taiwanese academic training, but I had been interested in Expressionist and Fauvist painting. I truly discovered the humanistic and imaginative creative spirit of modern art when I went to study at the La Cambre Art Academy in Belgium in 1982. The man who had the most influence upon my works was one of the founders of the Cobra Group, Mr. Noiret. The Cobra Group was founded in 1948. Its name was made up with the first syllables from the names of the cities of Copenhagen, Brussels and Amsterdam. It was an highly active European art movement. Its members pursued an unrestricted expression, wanted to interact with the world in a direct and emotive way, and made works using paint and other mixed materials. The Cobra artists carried on the tradition of Northern European Expressionism, resulting in highly subjective paintings with strong colors and bold outline. My early paintings during this period were very grand and bold, clearly under the influence of the Cobra style. I build up my own visual language to express my thoughts on nature, animals, and humans with intersecting structures of primal colors. My works are straightforward expressions of my inner mental world. I believe my works can bring you different visual experience. Enjoy! 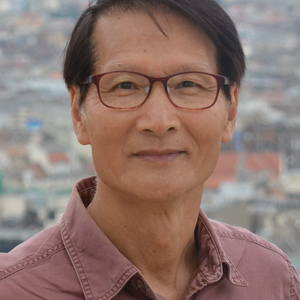 1950/born in Miaoli, Taiwan, R.O.C. 1974/Graduated from Fine Art Department, National Normal University. 1982/Going abroad for further studies in Belgium, first studying in Academie Royale Des Beaux-arts, Bruxelles, later going on to L'ecole Nationale Superieure Des Arts Visuels De La Cambre. 1985/Graduated from L'ecole Nationale Superieure Des Arts Visuels De La Cambre with honors degree Excellence, and awarded the highest (third) grade diploma in art education. 1986/Back to home country, teaching as lecture in National Taiwan Art academy and National Hsin-chu Normal College, now working as a professional oil painter and ceramic-porcelain artist. 1986/Woman and child, in Musee D'Ixelles, Bruxelles. 1988/Primitive, in Taipei Fine Arts Museum. 1994/With the Coming of Spring, in Taipei Fine Arts Museum. 1998/The Workings of Natural Selection, in Kaohsiung Fine Arts Museum; A Moonlit Night, in Hsin-chu Culture Center. 1999/No name, in National Dr. Sun Yat-Sen Memorial Hall. 2000/Competition, in Miaoli Post Office. 2002/Happy Gathering, in Fo Guang Yuan Art Gallery. 2003/Hunting, in National Chiao-tung University. 2011/Looking forward, in National Dr. Sun Yat-Sen Memorial Hall. 2015/Gaze of Eagle, in Nanjing University, China. 1983-1984/Modern Painting Exhibition, in Bruxelles, Belgium. 1984/Artists Trends Exhibition, in Bruxelles Grand Place Belgium. 1985-1986/Solo show, in Hotel Van De Velde, Musee Horta, and National La Cambre Architecture Academy, Bruxelles. 1986/Solo show, in Taipei Fine Arts Museum. 1987/The New Look of Chinese Modern Art, in National History Museum, Taipei; 23rd Asia Modern Art Exhibition, in Metropolitan Art Museum, Japan; Chinese Contemporary Paintings, in National Seoul Modern Art Museum, Korea. 1988/The Third Asian International Art Exhibition, in the National Museum of Contemporary Art, Fukuoka, Japan; The Art Development of the Republic of China, in Provincial Taiwan Art Museum; The Times and the Unprecedented-Contemporary Arts in the R.O.C., in Taipei Fine Arts Museum. 1989/National Art Academy's Prof Group Exhibition, in Paris, France; Special Exhibition for the Artistic Development in Modern Times, in National History Museum, Taipei. 1991-2015/ more than 40 solo shows in Taiwan, China, and Macau. 2016/Solo show, in National History Museum, Taipei. 2017/Solo show, in Chiang Kai-shek Memorial Hall, Taipei.